Now that the weather is getting cooler, it’s okay to eat hot pots placed on open fires. 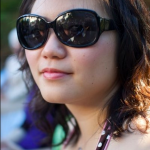 One place for hot pots on open fires that recently opened up is Tasty Dining, located in the plaza across the street from a shady looking Chinese bar where women in short skirts and men with fancy cars frequent. Will ordered the “Wuhan Hot Noodles with Sesame Paste” which apparently is a Wu Han speciality. It translates to “warm, dry noodles” which is pretty descriptive of what comes to you in a bowl. The noodles are slightly sauced with sesame paste, a little soy sauce, pickled vegetables and ground meat. Order it without the meat if you want a vegetarian version. It goes pretty well with the fried, spicy, peanuts that were brought to our table. Shown on the walls next to our table were large steel bowls of assorted things and chili peppers. These are what the menu calls “Griddled Cooked Foods.” I ordered a “Griddled Cooked Cat Fish” which was catfish, not cat and fish. The waitress asked what spice level I wanted it and I told her “medium.” Unfortunately, the small size of the dish is not available at dinner, so either come with a friend and a big appetite, or come for lunch if you want a small. The medium size is going to last me a whole week. The waitress brought out a chafing dish and placed the already hot steel bowl of food on top. The “Griddled Cooked Foods” is known in Chinese as a “dry hot pot.” Not to say it’s completely dry, because it’s too oily to be considered actually dry, but it’s not soupy like hot pot places like Fat Little Sheep. My bowl contained chopped pieces of tender, flavorful catfish, cauliflower, celery, plenty of garlic cloves, and thick slices of potato. The potatoes were the best vegetables in there because the hot, spicy, oil cooked them into a melt-in-your-mouth consistency with plenty of flavor. From what I’ve read of these dishes, they’re supposed to be a little numbing, but I found mine to be mainly spicy. Maybe I didn’t get to the numbing part yet, since I was the only one tackling a pretty large bowl of catfish, but it was definitely not the most mala dry hotpot I’ve had. The medium spice level was perfect for me, but for people who aren’t used to spicy foods, there’s a “small spicy” level available as well as a “no spicy” option. We were there during some grand opening promotion where they were offering free glasses of cold chrysanthemum tea. I strongly suggest people take advantage of this since the cooling beverage will come in handy after eating too many bites of chili pepper. The menu doesn’t boast too many vegetarian things, but a few dishes could be made vegetarian with modifications. 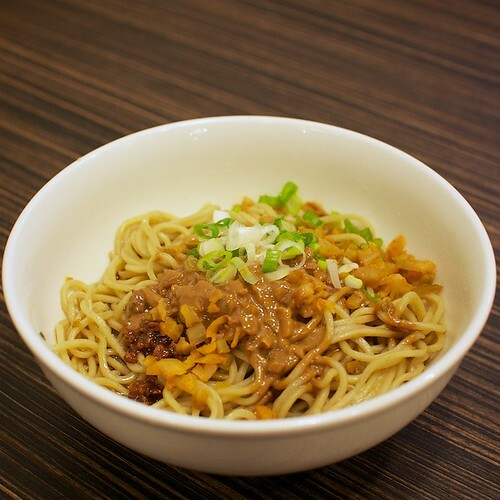 The wuhan hot noodles with sesame paste can be made sans ground pork. I tried both versions and they tasted fairly similar, other than missing ground pork. There’s also a dessert-type pastry called “Pumpkin Cake” on the menu. 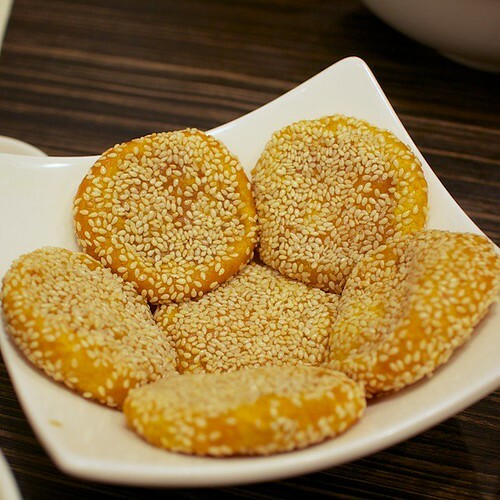 These are chewy flat discs of pumpkin and sticky rice that are deep fried and covered with sesame seeds. They’re best eaten while still hot. 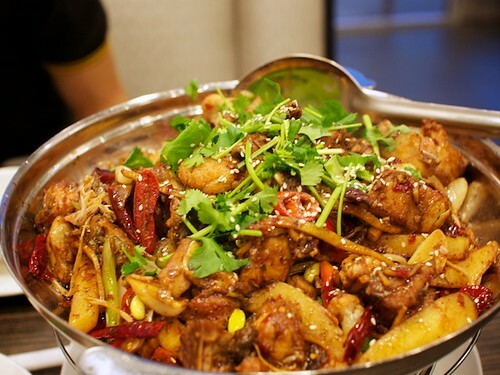 Although it’s not on the menu, the restaurant can also make a vegetarian dry hot pot. Just ask for it and specify what ingredients you want from the “Side Dishes” part of the menu. Also make sure to ask them to leave off the chicken-flavored MSG since that’s in the seasoning by default. There’s so much fresh chili, ground chili, garlic, and ginger in the oil that a vegetable-based hot pot will probably be as flavorful as a meat based one.